The collar and cuff sling is a special contraption for treatment of different types of arm injuries. It consists of one big loop to put it around the collar bone and two connected small loops for arms support. Unlike a full-on arm support belt, this minimalistic accessory slings around the collar bone and supports the wrist. Traditional sling: The user puts his wrist in the small loop and supports it with the collar loop. Wrist Support Sling: In the above method, only one cuff loop is used for support. For enhanced relief to a sprained/fractured wrist, you can use both cuffs. Place your fingers at the front and the wrist at the back loop. Arm Support: The extendible cuff loops can be stretched to support the forearm and the wrist simultaneously. Talk to support when in doubt. Consult your physiotherapist directly if necessary. Follow the safety instructions with the package. Keep the collar and cuff sling away from Children to prevent choking hazards, unless it is necessary for an arm injury. Do not neglect on supervising your child all the time. Make sure that it is totally dry before you use it. The weight of sogginess can actually affect the balance of the product. Do not dry it over a radiator or a tumble drier to avoid shrinkage of the material. Prefer direct sunlight instead. Make sure that your product is not used by anyone else as it can disrupt the unique comfort settings for your arm. For regular maintenance, use a wet cotton swab to wipe off the grime. Do not wear it to bed. Allow occasional rest whenever possible for relief to the neck muscles. Continuous usage can result in skin rashes at the collar and cuff regions. Maintain its breathability by regular care. Accumulation of sweat particles tends to clog the pores in the material. It allows the flexibility to move the arms. Use this comfort feature to regain your strength by daily exercising. Inform the doctor of any discomfort such as numbness, pricking sensations at fingertips, skin blisters, redness, and swelling. You may not be wearing it in the best way. It is often the first aid accessory for patients with arm fracture in the emergency room. Although its common use involves sprain relief, yet it has varied uses for fracture treatment as well. Patients are provided it in emergency rooms before the doctor attends the broken bone. 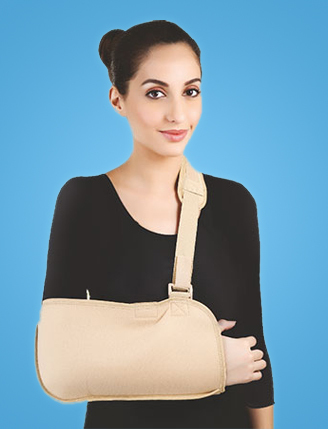 It is prescribed along with the arm cast for additional support in complicated cases. Finally, after removing the cast, the collar and cuff sling is useful for recovery support. As mentioned above, there are different ways you can use the collar and cuff sling, depending on the type of physiotherapy treatment you are on. The specialist would show you how to use it. You can also consult our customer support for directions. We would be happy to clarify any confusion you may have. Kindly go through the information provided here to help you. The NHS also recommends its use under a licensed physiotherapist.